Captain Dan Lenson is under fire both at sea, and in Washington. His command of the first antiballistic-missile-capable cruiser in the Fleet, USS Savo Island, is threatened when he's called home to testify before Congress. There, he must defend his controversial decision to prevent a massive retaliatory missile attack by Israel against civilian targets in the Mideast. Shaken by the near-end of his career, Lenson returns to command uncertain of his own future, but determined to do his best by a damaged ship and an increasingly divided crew. Ordered to the Indian Ocean, Savo cruises off East Africa, protecting shipping lanes from pirates. But this seemingly-routine patrol turns ominous when an unknown assailant begins assaulting female crew members. But then, an explosive showdown begins between India and Pakistan...with Savo Island, and her unique but not yet fully battle-ready ability to intercept ballistic missiles, standing alone between two nations on the brink of the first theater nuclear war. Dan will have to battle tsunami-driven seas, incoming weapons, and a quickly tilting balance of power, as China moves inexorably in her bid to displace America in the far Pacific. 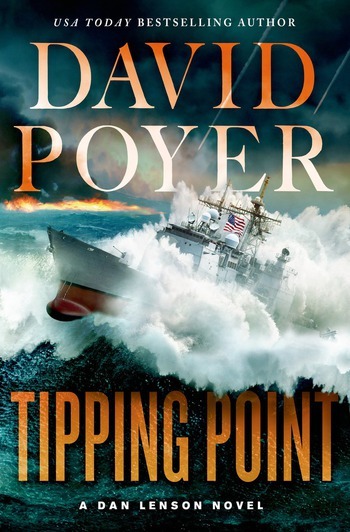 The fifteenth novel in David Poyer's acclaimed series of naval adventures featuring Dan Lenson, Tipping Point is an action-packed, utterly authentic story of duty, war, and the stress of command, by the most popular living author of American sea fiction. DAVID POYER's sea career included service in the Atlantic, Mediterranean, Arctic, Caribbean, and Pacific. Tipping Point is the fifteenth in his widely popular series featuring Captain Dan Lenson. Poyer's work has been required reading in the Literature of the Sea course at the U.S. Naval Academy, along with that of Joseph Conrad and Herman Melville. He lives on the Eastern Shore of Virginia.